To loose a whole life and not know why changes Olinda’s perspective on who, and what she is. Discovering that myths and legends from the pages of fantasy are true and you yourself are a myth defies logic. For Olinda this is no story. One day she was a grief stricken daughter coping with the loss of her beloved mother. The next she is running for her life and keeps on running for three, long fraught with danger, months. 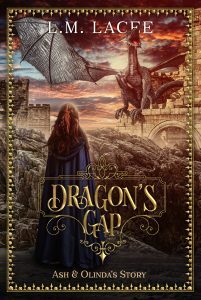 Until she finds Dragon’s Gap, a place of safety and peace. I Know one should not have a favorite but I have got to say if … And that is a big IF I was to… which I do not have a favorite… It could well be this story, if I did. Ash and Olinda, they each grabbed me and did make writing this so very hard. In fact this story took the longest to write not because the story is terribly involved or intricate. It was finding how Olinda could come back from being a person who she never expected to be. A person who was placed in a situation that she never expected to have happen to her and on top of all that to end up with someone who had their own issues of trust. Just as well, Ash was a Shield and strong enough in his own way, so he was able to melt the hardness around Olinda’s heart. He really needed to be because if not him… who? I am so very glad that he could.